Each day in Africa is full of wonders. However, there are some times of the year that are truly MAGICAL! 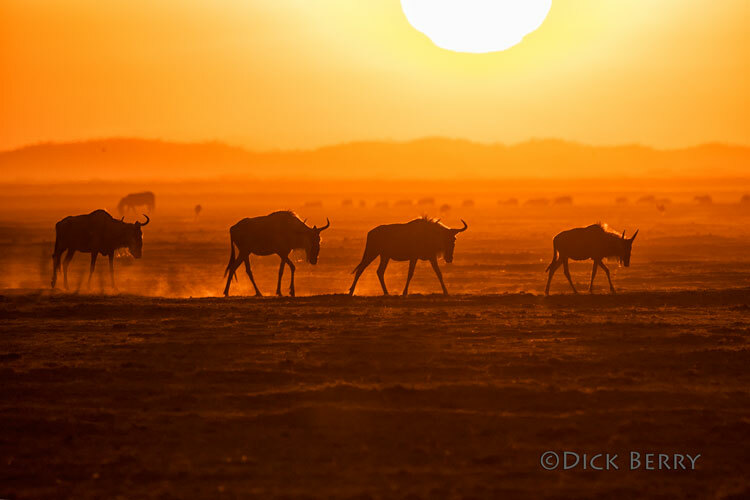 The Wildebeest Migration is a dramatic display of an unstoppable drive to survive and the power of natural instinct. Consequently, the animals produce an iconic and remarkable show that we can have front row seats to. Witness this spectacular marvel for yourself! Use the Migration Route Map & the Month by Month Guide to the Wildebeest Migration below to find out the best times to travel! In addition to coordinating with nature’s schedule, the right time to travel should based on what YOU want to see! Get amazing shots of the largest concentration of land animals in the world! Witness the beautifully emotional calving season! Or watch the herds make the cross through the mighty Mara River. The timing of the migration depends entirely on rainfall. Luckily, the wildebeest are on a continuous journey creating endless opportunities to see to this stunning natural event. We promise… Africa won’t disappoint. The Wildebeest Migration is a powerful act of nature that is determined by somewhat predictable migratory patterns but mostly by rainfall. Therefore, increase your exposure to the migration by planning to be in the right places at the right times. Our month by month guide to the wildebeest migration will tell you where and when the migration is during each month of the year. *Again, plan with careful consideration of current and future rainfall predictions. 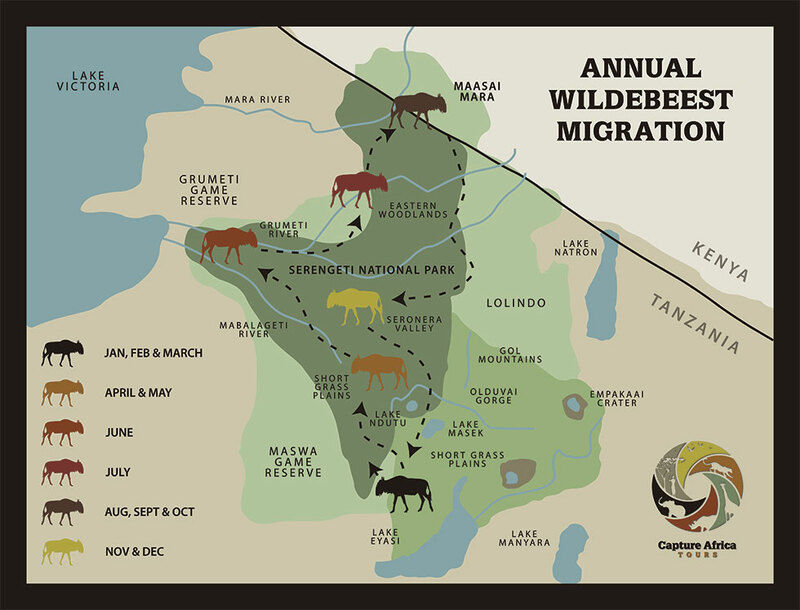 Check out our detailed version of the Wildebeest Migration Map in Google maps! Nov – Dec : Migration begins as the short rainfalls arrive. The herds move south from the eastern Serengeti towards Ngorongoro Crater and the Ndutu area. Jan – Mar : The herds remain in the southern area of the Serengeti grazing on newly grown, sweet green grasses. Calving season in late January – February. April – May : The herds travel northwest through the central region of the Serengeti. Grazing & raising young as it moves. 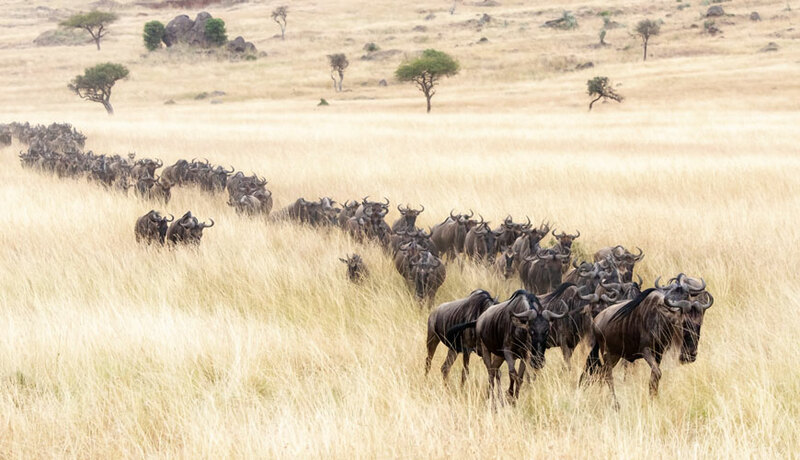 June – July : After encountering the Grumeti River, the herds continue through the northern Serengeti. 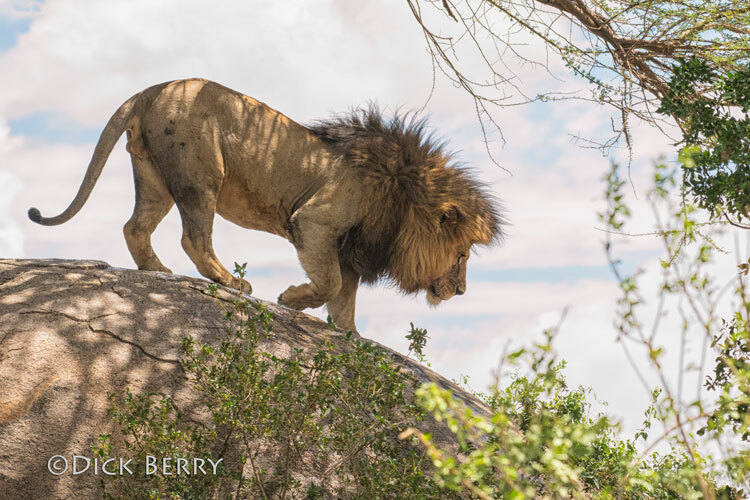 They head north towards the Maasai Mara in search of more food. Aug – Oct : After reaching the border of Tanzania & Kenya, the herds congregate in the northern area of the Serengeti. Then the big moment…The herds begin making the dangerous cross through the Mara River into the Maasai Mara. Oct – Nov : Once across the river, the herds will spend time grazing in the southern region of the Maasai Mara Game Reserve. Then they will continue south towards the eastern plains of the Serengeti… Back to where it all began. Nov – Dec : When the short rains arrive, the herds will start their migration journey over again. They will begin heading farther south in the Serengeti towards fresher green grasses. Plan like an expert! Pinpoint the PERFECT time to travel with more Helpful Tips on the Best Times to Visit East Africa! FULFILL your WILDEST Safari DREAMS! JOURNEY to see the WILDEBEEST MIGRATION! 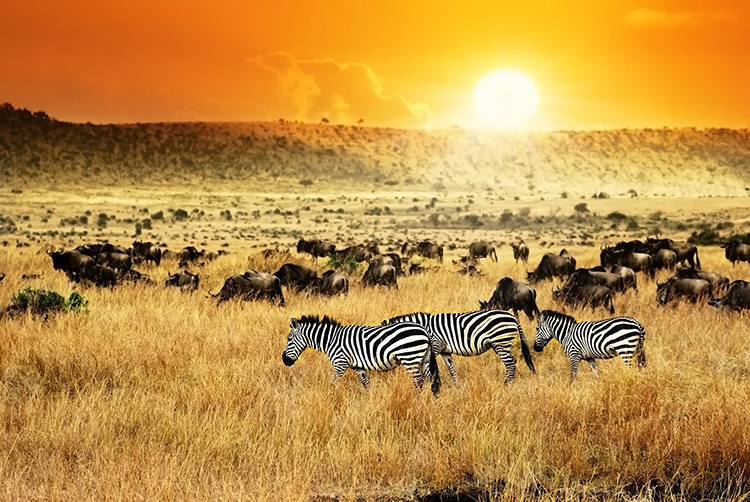 On this classic safari, we visit beautiful & iconic locations to witness the natural wonder of The Great Migration and the BEST of Kenya & Tanzania! Our most passionate goal is to provide you with a memorable & authentic safari experience made of once-in-a-lifetime moments.